A few weeks ago, I was lucky enough to enjoy a behind the scenes peek at the storage facilities of the Art Gallery of NSW. I arrived after a hectic day at work, with little idea of what to expect. The evening started with a warm welcome from the Art Gallery of NSW Society volunteer guides, a glass of champagne and a brief overview of the evening ahead: we were to be split into two small groups, and would have the chance to view some of the storage facilities and works in store. I started to get excited about the possibility of seeing some of the Arthur Streeton Venice works in store and kicking myself that I hadn't thought to look up their accession numbers in advance. It's titled Fishing Boats, Venice and was painted in 1908 during Streeton's honeymoon visit to Venice. 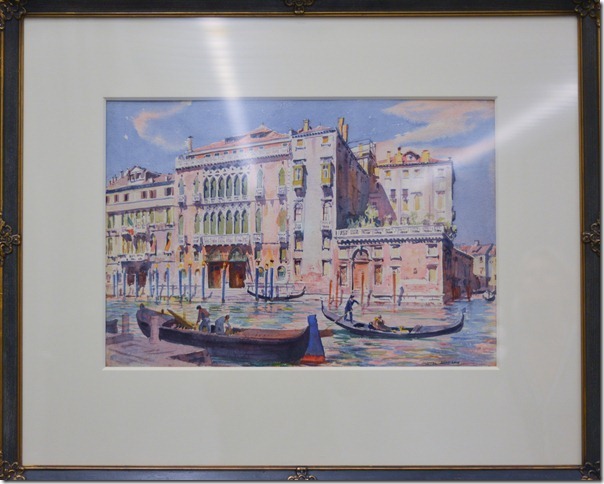 The collection includes two other oil paintings by Streeton of Venice, Moonlight, Venice (1908) and Grand Canal, Venice (1927) and two lithographs, Palazzo Labia (also with a view of fishing boats) (circa 1913) and Canal Scene (circa 1913. 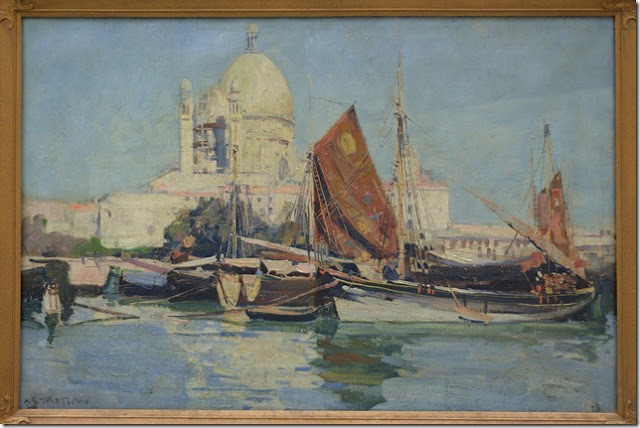 View my previous post about the Australian artist Arthur Streeton in Venice. A few minutes later, we also found a small watercolour by Australian artist, Lionel Lindsay of Titian's Palace (circa 1933). What a wonderful tour, and what a wonderful way to find a bit of Venice in Sydney. Why is the Lindsay painting called "Titian's Palace"? That is not Palazzo Tiziano - I've never heard of such a palace in Venice. The palaces in the painting are the Palazzo Barbarigo della Terrazza, on the right, and the Palazzo Pisani-Moretta in the centre. Hi Bert, thanks for identifying the two palazzi for me. I'm sorry, I don't know why Lindsay called it 'Titian's Palace'. I just thought it was a fanciful title for the watercolour!